Rajinikanth is back from the US to join the film in grand sets erected in Chennai. 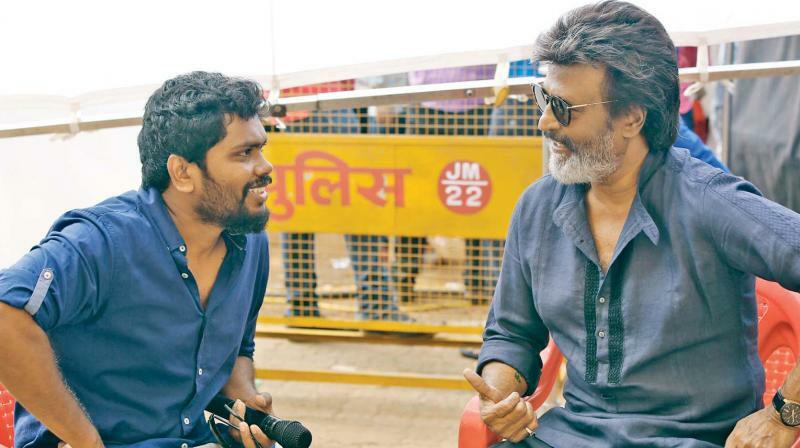 Pa Ranjith and Rajini on the sets of Kaala. Ever since it’s announcement, the Kaala buzz never seems to cease. The film’s shooting, which kickstarted in Mumbai in May, continued there for a few weeks. A couple of weeks ago, ‘Superstar’ Rajinikanth flew to the USA for undergoing a health check-up, and now is back to rejoin the sets of the film in Chennai. The production team had been working for months on erecting a massive set to replicate Dharavi, where the film is centered. A source close to the Kaala’s unit tells us, “Almost all of Rajini sir’s portions will be completed at the sets over the next two months. He is expected to shoot continuously in this schedule.” Nana Patekar, who plays the role of the antagonist in Kaala, is expected to join the sets early in August. Once the Chennai schedule is done with, the team will once again move to Mumbai and shoot the remaining portions. The film, which also stars Eswari Rao, Huma Qureshi, Samuthirakani, Anjali Patil, Dileepan, Shayaji Shinde and Pankaj Tripathi as part of it’s ensemble cast, will have music by director Pa Ranjith’s regular, Santhosh Narayanan. Produced by Dhanush’s Wunderbar Studios, Kaala is expected to release for Pongal 2018.